Rusted-out metal fireplace? Badly damaged masonry fireplace? Let us build you a new fireplace! Our niche – complete all restoration without any damage to decorative exterior face bricks or rock work. We gut your existing fireplace firebox whether it’s metal or brick and re-build from the inside by way of the fireplace opening! There’s more to a fireplace than just the firebox where you build the fire. The smoke chamber (just above the firebox) and the flue system must be considered for a complete fireplace system. 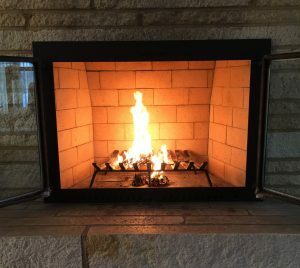 Schedule an inspection today to restore your fireplace. We will complete a thorough inspection of the entire burning system then send you a detailed work proposal for your review. We have learned it’s important to complete an inspection of the entire wood burning system from top to bottom. No sense fixing one part of the system to later learn there are other areas that needed care. Our inspections and work proposal write up takes time and we do charge our normal inspection rates.